I have a new bike, sample-size feet, a family that loves me, a cool job, kickass friends, and an impressive ability to come up with limericks on cue. 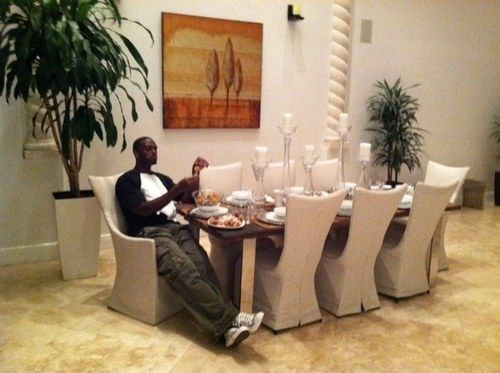 And I’d abandon all of those things in a heartbeat (except maybe the feet) if I could witness the scheduled dinner between Plaxico Burress and Tom Coughlin on Friday night. I’ve been thinking about it nonstop for two days. Where will they go? What will Plaxico eat? Will one get to sit in the comfy side of a banquette and the other get stuck in the chair? Or will the scene look more like this, except with Coughlin photoshopped in, preferably clad in that odd priestly getup he wore during the New York Giants’ 2008 victory parade — a parade that Plax didn’t even attend but that would have never happened if not for his 11 receptions against Green Bay in the NFC championship game and his game-winning catch with 35 seconds remaining in Super Bowl XLII? That catch, of course, is why any Giants fan cares, why any one of us felt a small thrill a few days ago when Adam Schefter announced unexpectedly that the Giants had been chatting all day with their former WR. Others soon weighed in — CBS’ Mike Freeman made the strong case that the whole thing was just for show — but la la la I couldn’t hear him cause I was too busy perusing no. 17 jerseys on eBay with Ace Frehley blasting on repeat in the background. It’s a little strange that I harbor such good will toward Plax. In the same calendar year that he helped win the Giants the Super Bowl he also torpedoed their chance for another one when his unlicensed and unholstered gun discharged into his quad. The news was, at that point, barely even a surprise. In the months leading up to his self-shooting alone, he was fined and suspended for a week by Coughlin for missing a team meeting and not answering his phone, and fined by the league for making comments to and about officials and throwing a ball in the stands. In all, Plaxico has reportedly been fined between 40 and 50 times in his 57 career games with the Giants, usually for skipping meetings and training sessions — in much the same way he once missed a pre-NFL draft workout with the Philadelphia Eagles to go watch his Michigan State buddy Mateen Cleaves play in the NCAA Final Four. Plax reportedly “took the fines without incident,” just as he did more than a decade ago when, as an 18-year-old student at Fork Union Military Academy, he refused to salute his superior officers — many of whom were as young as 12 — preferring to take the punishment of trudging up and down hills. The anecdote fills in the picture of Plaxico as defiant and rebellious, unwilling to listen to those in command. And yet there’s something relatable, and almost endearing, about it. Who among us would want to defer to some 12-year-old punk on a power trip? Say what you will about the tenets of anti-authoritarianism, at least it’s an ethos, you know? What’s notable about Burress is that despite these distractions and stubborn displays, it was tough to find a Giant who disliked him. He wasn’t some malevolent locker room cancer. He was more like a child testing limits. Even Eli Manning, who would visibly shrink around a ranting and raving Jeremy Shockey, had a genuine chemistry with and fondness for Plax. When Burress ran his big mouth in the days leading up to Super Bowl XLII, predicting a Giants win over the 18-0 Patriots — which was, come to think of it, the angriest at him I’ve ever been — Manning stood up for him.“Believe it or not, he’s very low-key and down to earth,” he said. Tonight, this unpredictable soul will sit down with Coughlin (at least I hope he will) to discuss whether they can forge a new future together, whether each can bend just a bit toward the other. My fingers are crossed that they can. Yes, he might be 34, but don’t forget that before he was sent to the clink he was reportedly playing on a badly injured ankle. He’s had two years to heal, so I believe his claims that he feels as good as he did in college. With the league in post-lockout flux, Plax’s time away from the game no longer seems like that big a deal, other than to have given him a much-needed dose of perspective. Most importantly, he still stands tall at 6-foot-5, all the better to haul in those trademark Manning high wobblers, and maybe get the Giants the playoff win that’s eluded them since Plax went away. Oh, man. What I wouldn’t give just to hear what those things are. Will We Ever Feel Comfortable With the Coach's Son?